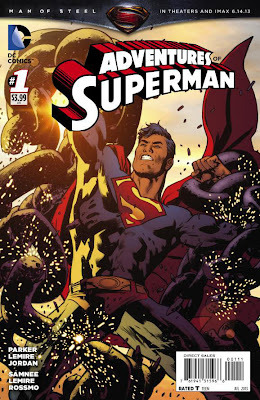 Adventures of Superman #1 came out last week, at least in print form, and simply floored me with how fantastic it was. 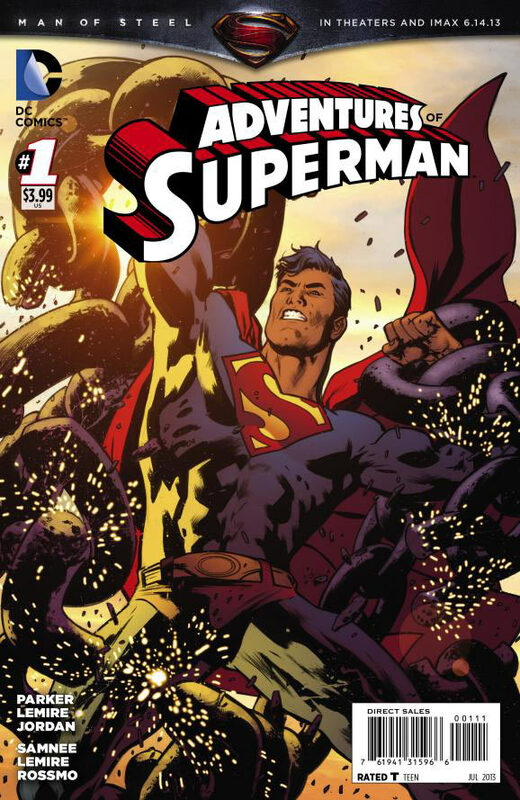 A digital first book, then put into print form, Adventures allows great talent to write a Superman story unlinked to the current continuity and this book brings together three great creative teams. I know this is a late review for all those who got this digitally. But this book needs to be reviewed and revered. 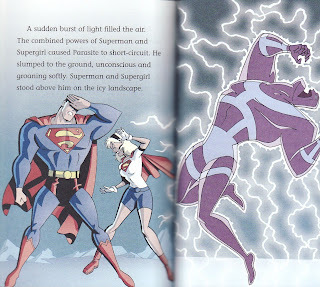 This book also showcases a much more classic Superman, looking to help, trying to figure things out before punching, and wearing red trunks on the outside! I find it interesting that none of these first three stories has Superman in his New 52 costume. I also found it interesting that this felt like my Superman, read like the Superman stories I want to read. It has been a while since I felt like that. It was stories like this that made me a Superman fan to begin with. I was simply blown away by this book, completely entertained and thrilled that Superman still exists out there in stories like this. 'Violent Minds' is the first story, written by Jeff Parker and drawn by Chris Samnee, both creators currently working for Marvel. In it, an addled young man named Leon is ripping apart a Metropolis city block. It is clear that he is under the influence of some sort of drug which has either unmasked or given him telekinetic powers. Angry, paranoid, and powerful, he is confronted by Superman. 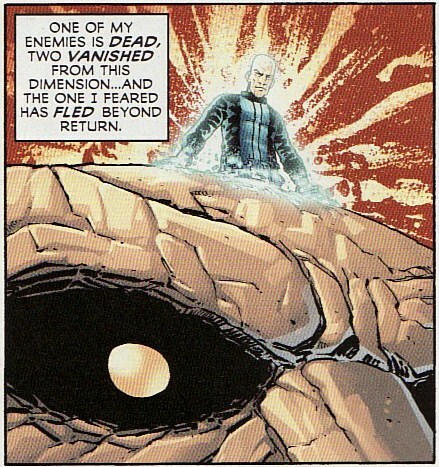 How great is that first panel? After rescuing people and minimizing the destruction, he approaches Leon hands up, recognizing his pain, and offering to get him to medical assistance. Superman is here to help. He doesn't throw the first punch. He tries to talk Leon down. After further damage, including a fireball from a burst gas line, Leon's mind simply burns out and he dies, leaving Superman with a lot of questions and a lot of rubble to sift through. And then we get a great denouement. It was a Luthor designed drug which unleashed Leon, a repeat experiment as Lex tries to figure out a way to destroy Superman through others. For me the most chilling panel is the second one. Look at the small smile on Luthor's face as he talks about the information gained and the scientific method. There is no feeling at all for the death of Leon or the damage to the city. That is one evil man. Just a great story filled with action and ethics! And Samnee draws a spectacular Superman! The next story is named 'Fortress' and is written and drawn by Jeff Lemire. In the story, two young boys pretend play to be Superman and just about every Superman villain you can think of. From a 'classic' silver robot Brainiac to Bizarro to Luthor, General Zod, Mt Mxyzptlk, and then back to Bizarro, the two imagine Superman saving the day. Lemire does a great job shifting back and forth between the kids and the Superman play. I like how the imagination panels have the straight edges while 'reality' is crooked. I had to laugh a bit at the over-the-top dramatics and frank assessments of the villains by the boys. The story ends on a sentimental note. The boys walk home and discuss how Superman never loses. And then we see Superman, sitting on a water tower. He was listening to the boys' play seems pretty content about their play. I thought that the boys' play showed that it is pretty easy to 'get' Superman. Even these kids understand him. This was a sweet and satisfying story. The last story 'Bizarro's Worst Day' was written by current Superboy scribe Justin Jordan and drawn by Riley Rossmo. 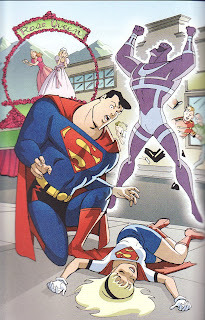 Of course, we know that Bizarro's worst day means it is his best day. 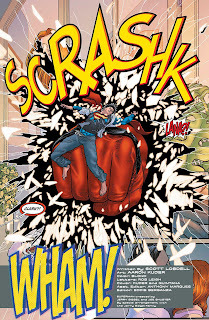 And, as I did in Superboy #20, I love the lilt of humor that Jordan puts into the story. 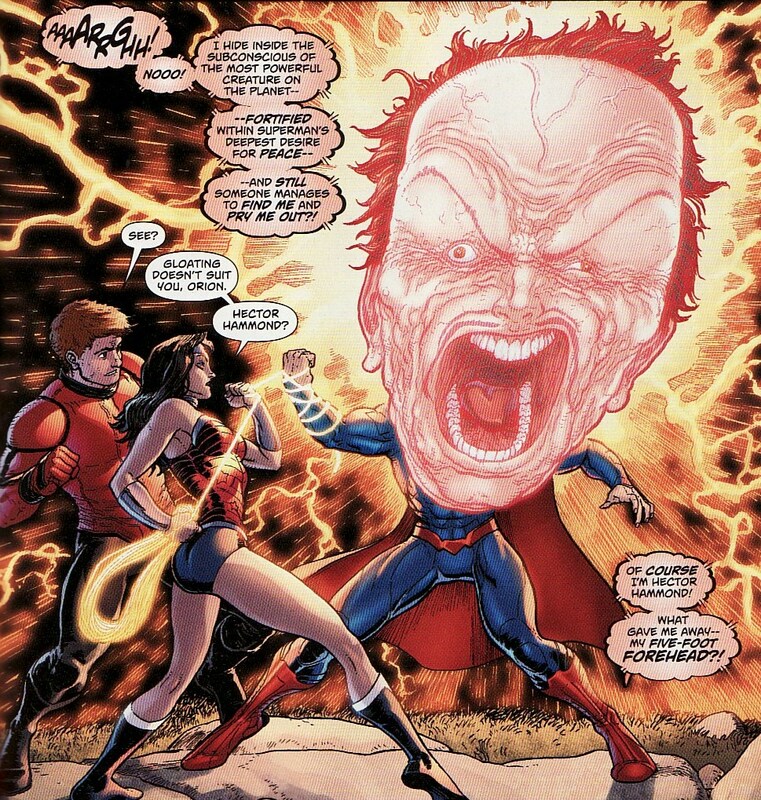 Jordan portrays Bizarro as a confused being, not malevolent, but endangering people with his distorted viewpoints. And when Superman tries to talk sense into Bizarro, the two end up fighting. 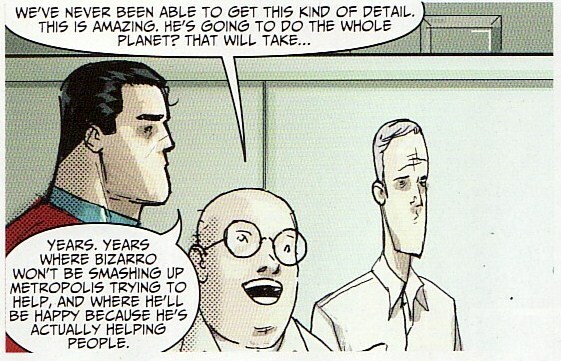 Of course Superman can't talk sense into Bizarro! He needs to talk nonsense into Bizarro! 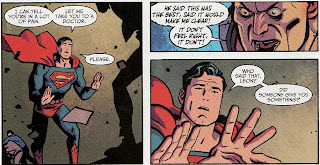 Even I had a hard time comprehending what Superman is saying here. Superman will help/hurt Bizarro to help/hurt people. 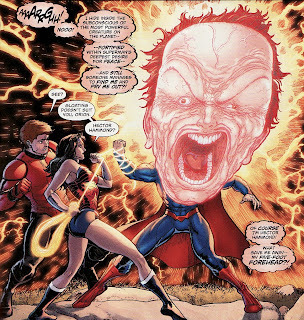 And Bizarro would love/hate that. Accckkk! And again, in a sort of classic way, Superman turns a problem into a solution. He somehow convinces Bizarro to fly around a planet for NASA, photographing and cataloging the planet's surface. And, as a bonus, it will keep Bizarro away form Earth for years. I loved the backwards dialogue and chuckled that even a super-brain like Superman's seemed to struggle with what to say. 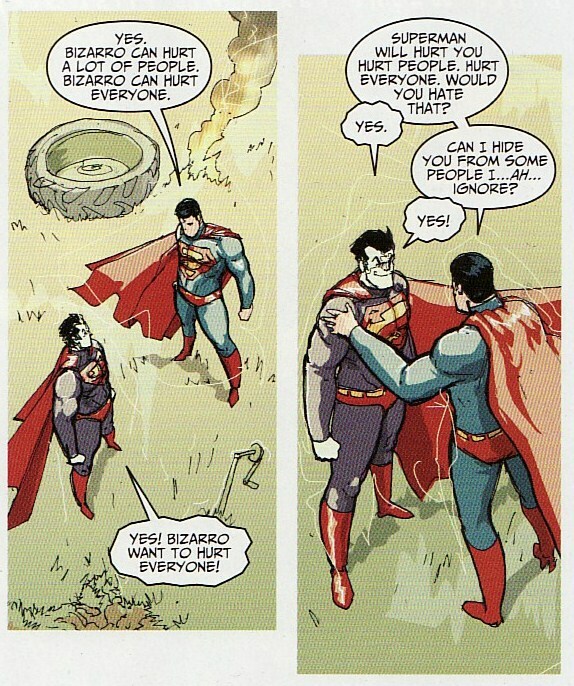 And, again, it showed some ingenuity on Superman's part to try to minimize the violence and help people. Rossmo's art was great hear, showing a sort of broad jawed Superman which felt classic in a early Silver Age sort of way. Three great Superman stories for just under four bucks. My sort of Superman. Unbelievable! So if you struggle with the characterization of the current New 52 Superman ... if you are looking for a straightforward interpretation of Superman ... if you want to see Superman handled by great and unexpected talent, this is the book for you. I can't tell you how happy this book made me. I am always thrilled when I see Supergirl popping up in places that I wouldn't expect or aren't aware of. 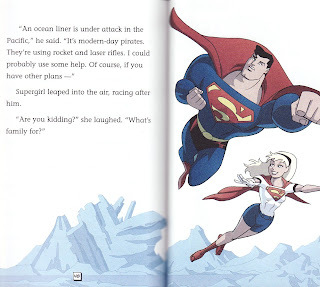 And so I was pretty thrilled to come across this early reader 'chapter book' based on Superman the Animated series and starring Supergirl. 'The Stolen Superpowers' was written by Martin Powell with art by comic veteran Rick Burchett and Lee Loughridge. 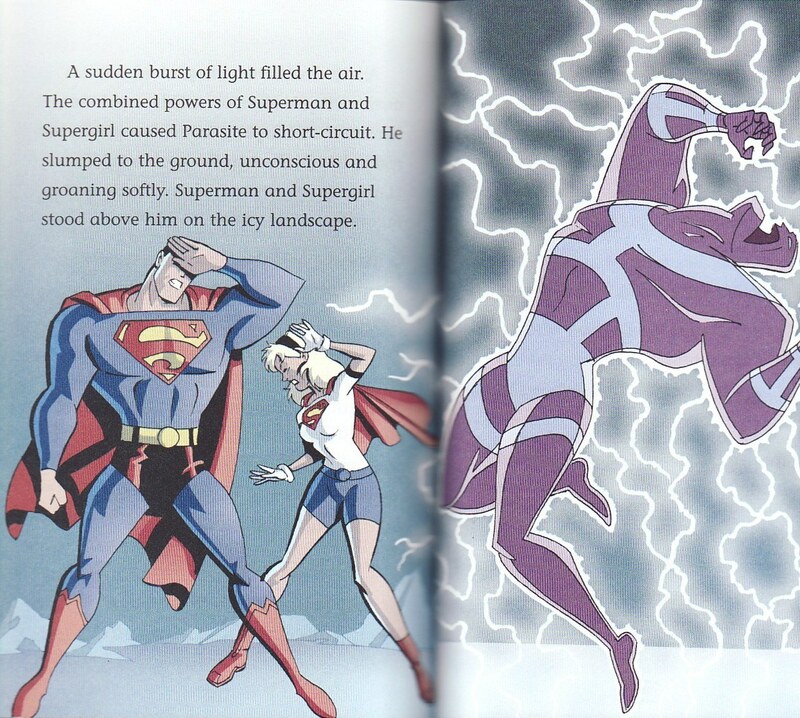 The book riffs on the Bruce Timm Superman, right down to the look of the main villain The Parasite. Unlike the S:TAS Supergirl, the Supergirl in this story seems very young, trying to do what's right but making some pretty basic rookie mistakes. I might grouse at such things usually but I think it works well here. The audience here is going to be a very young one and those readers will identify with another 'kid' trying to do what's right, trying to make their family proud, and needing to learn some lessons. It is clear this Kara's heart is in the right place even if she needs some saving. Supergirl initially tries to help Superman save a city from a raging chemical factory fire. She uses her super-breath, unfortunately spreading the flames and Superman has to save the day. 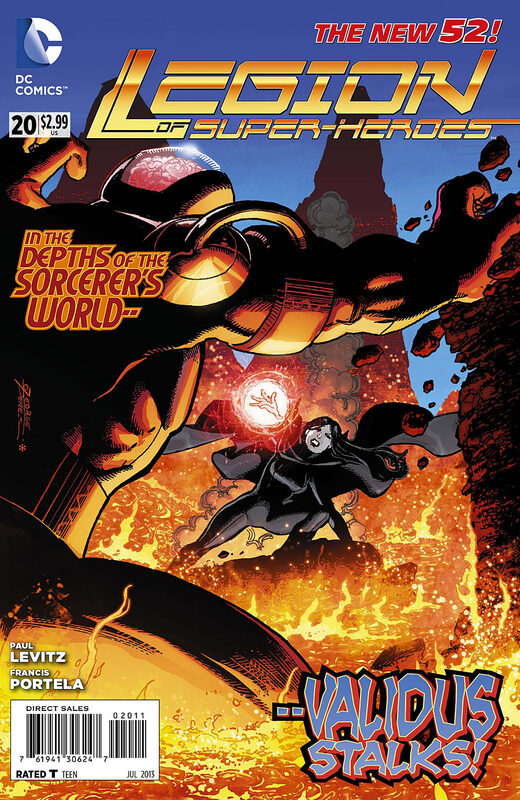 It is reminiscent of more classic Silver Age stories, including the lecturing Superman gives her. He is actually pretty understanding, grateful she tried to help but asking her to think a bit more when using her powers. Ironically, though she almost made things worse, the town wants to recognize Supergirl as the queen of the town parade and who wouldn't want to do that. The fire also weakened the power grid on Stryker's Island prison and the Parasite escaped. Meanwhile, Lois and Clark also arrive in the town to interview Supergirl. 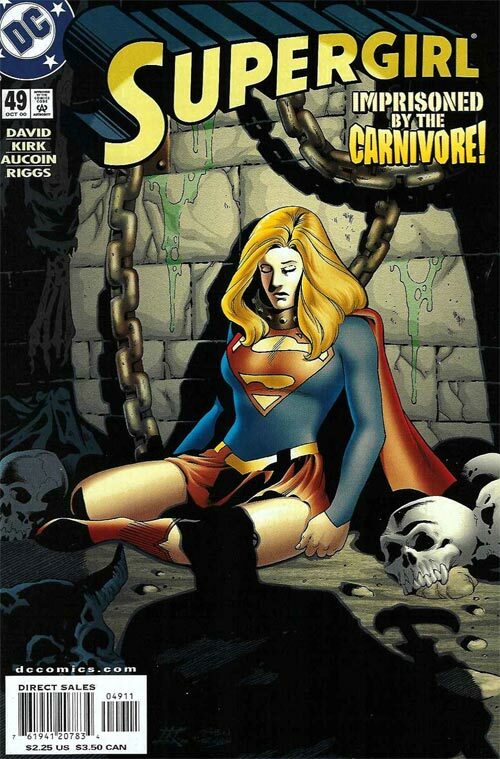 All the characters converge and the Parasite ends up draining Supergirl of her powers. Superman and the Parasite end up brawling across the Earth and up to the Arctic and into the Fortress of Solitude when Supergirl shows up, re-powered. 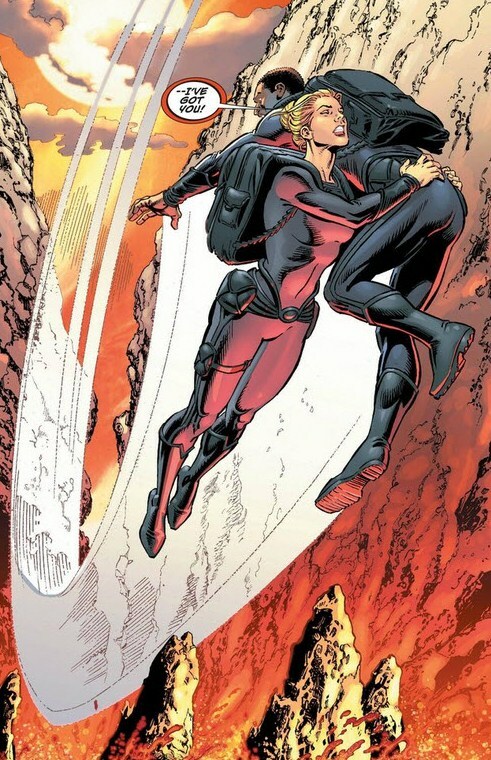 With Superman already in the Parasite's clutches, she flies up and grabs him as well. 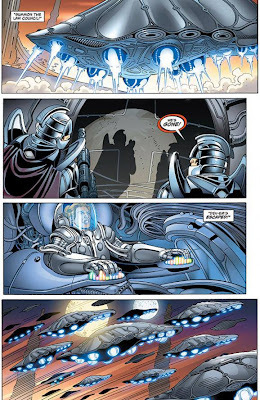 The power of the two kryptonians overload the Parasite who ends up passing out. "That's the only way we could have defeated that monster," Supergirl pointed out. "Because we are family." "The cousins from Krypton were just too much for him." Despite her earlier mistakes, Superman invites Supergirl to join him in saving a threatened ocean liner. He doesn't ostracize her for trying. He embraces her. I like the 'can do' attitude of this Kara who desperately wants to help. And I like that Superman is understanding of her early trials and willing to help. 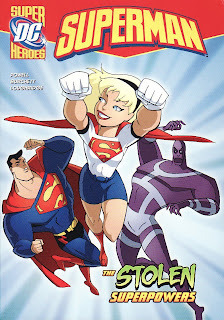 I also liked this sort of variant Animated Supergirl costume on this Kara. A full white shirt and blue shorts. It is a very nice look. I don't think I have seen it elsewhere. Like many kids books, there is a question page at the end, presumably to stir the conversation between parent/teacher and child as well as to makes sure everything was comprehended. Personally I like #2 and #3 of the writing prompts. 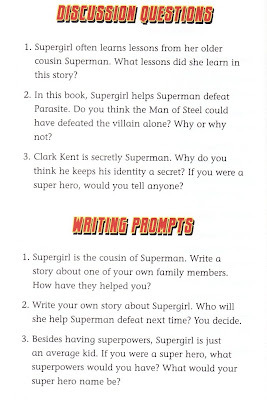 Imagine asking the reader to write a Supergirl story, not a Superman one? Nifty. My guess is I will be buying these as much as the Superman ones. 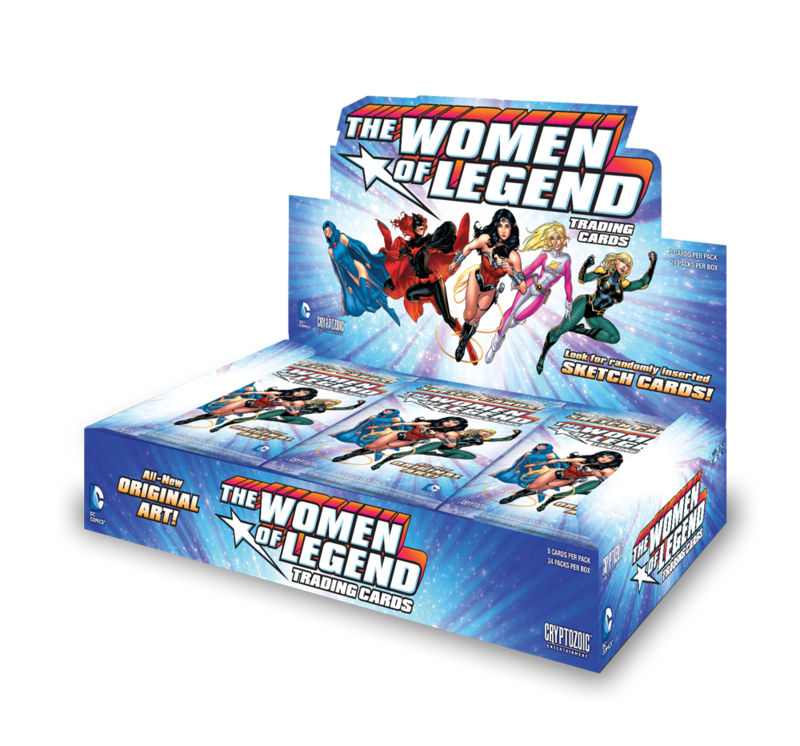 Here is the 'title card' by Ryan Odagawa showcasing a number of DC's most famous women. It is very nice and I am happy that Supergirl is displayed so prominently on the card. So looks like Cryptozoic will be taking more of my money very soon. I picked a couple of questions to post here and put some of my comments afterwards. CBN: This girl coming of age storyline reminds me of when Supergirl was first created and kept a secret from the public by Superman until she was formally introduced in a Grand Parade. 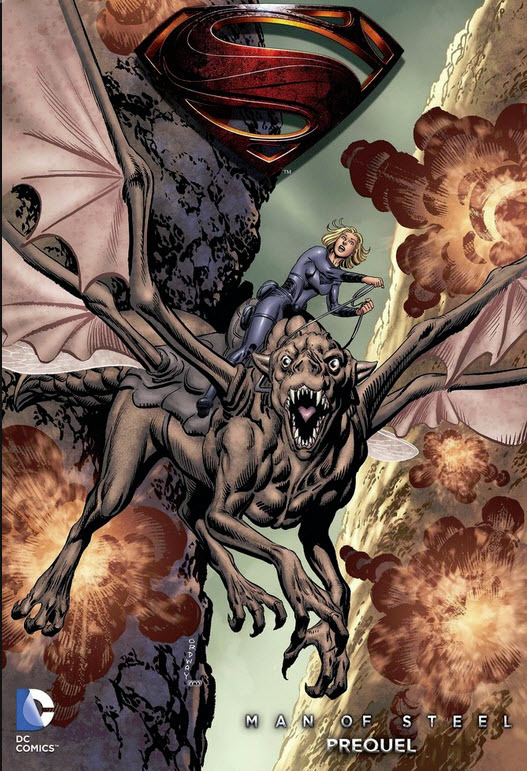 Is there any material from those early stories that you're looking to get for the New 52 Supergirl? Michael Alan Nelson: Most definitely not, no. I really want to come up with as much new material as possible. There will always be a core set of concepts with primary characters, their origins, their place in the universe, etc. 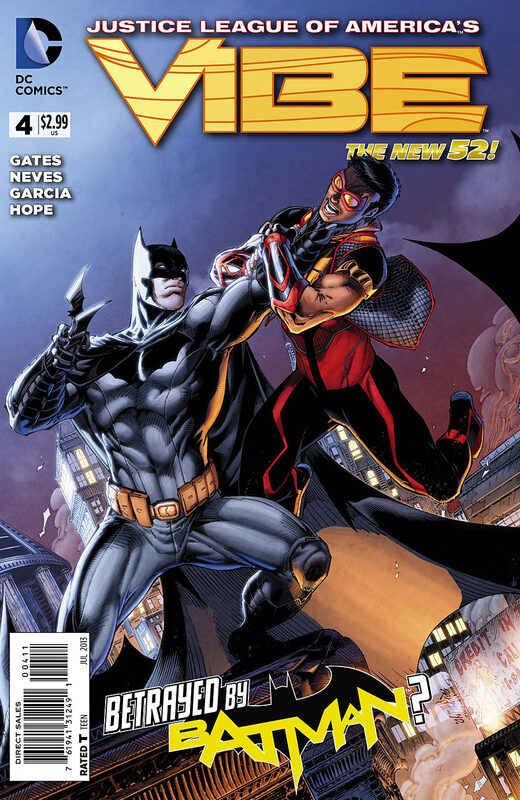 But the great thing about the New 52 is that it's really conducive to new stories, new ideas, new characters and situations. And though it's nice to be able to mine older stories for ideas and inspiration, I really want to find something new. Supergirl is such a rich character and with so much to her story yet to be told. So I am of two minds about this answer. Of course, no one wants to see retreads or retellings of older stories. 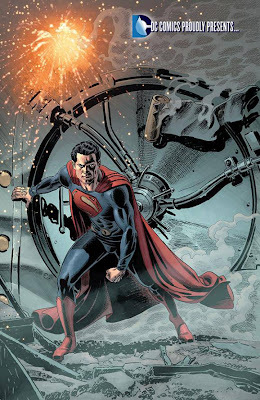 Certainly there is no place for the style of the earliest Action Comics stories in this 21st century world. So I doesn't necessarily bother me too much that Nelson wants 'fresh' stories. That said, I hope Nelson will read some of those stories, and the Superman Family stories, and Daring New Adventures, and Matrix stories including Peter David's version and Sterling Gates stories. I don't want him to read that stuff so he can copy arcs. But I hope that he will read them to have a historical feeling of who the character is. It would be 'fresh' for Supergirl to be a Deadpool-like character. But that isn't Supergirl. The fact he calls Supergirl a rich character makes me think he understands her history. I just don't want his fresh take to be contrary to all that has come before. CBN: Were you a fan of the character before taking over the book with issue #20? What is it about Kara that makes you want to tell her story? Michael Alan Nelson: I love the underdog aspect to her character. She always seems to be defined by her relationship with her cousin, Superman. And I want to explore how she comes into her own, learns to define herself on her own terms. Plus I find her situation simply fascinating. She's lost everything and desperately wants to find a place to call home, to have a family, to have relationships. But all these epic-level hardships keep getting in the way of that. I think it will be fun to see how she's able to create a life for herself while dealing with all of these situations. If she can at all. I see Kara twenty years from now, living a well-rounded, healthy life with a great circle of friends and family all while dealing with problems only a person with her strength and intellect can. But right now she's not even remotely close to being that person. How does she get there? What happens along the way? And that's what I want to explore. I want to see Kara's failures and successes she experiences along her journey into womanhood. Part of what I love about Supergirl is the life journey she is on. She has the powers of Superman but she isn't Superman. Not yet. Those growing experiences, those successes and failures, those are what drive Kara. The question is what foundation that this journey is built on. Classically, I would say it was joy and a sense of duty that drove Kara. She wanted to be as great a hero as her cousin. More recent incarnations have had her seem less happy-go-lucky and more determined to overcome some of the difficulties and sadness in her life. But always with that drive to do what's right. It seems as if this new 52 Supergirl is really built on tragedy. Throughout Mike Johnson's run there was still that feeling that this Kara knew right from wrong (I am purposefully forgetting H'El on Earth) and was trying to help. I get the sense Nelson has that same sort of understanding that Kara wants to be a hero. The fact that he pictures her in the future as leading a healthy life is a good start. CBN: Supergirl is in desperate need of her own rogues gallery. What new big-bads might we expect to challenge Kara during your run on the book, Mike? Michael Alan Nelson: Oh, dear. That is a good question. I'm really looking forward to helping develop villains specific to Supergirl and I think “Sanctuary”is a step in that direction. And it's already been solicited so it's safe to mention “Cyborg Superman.” I know many readers are thinking that he isn't Supergirl's villain. And they may be right. And they may be wrong. We'll just have to wait and see. But in addition to all of that, we're definitely working to build her rogues gallery. It's going to take some time, but we're getting there. Does Kara have a Rogue's Gallery? It seems with every re-thinking of the character, the creative teams want set her up against her own villains. I think 'desperate' is a strong word for the interviewer to use. 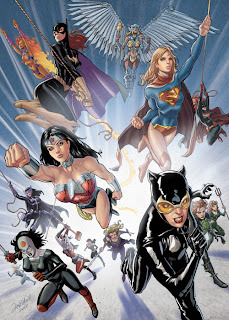 I think Sterling Gates set her up against the Silver Banshee, Superwoman, Satan Girl, and Bizarro Girl. 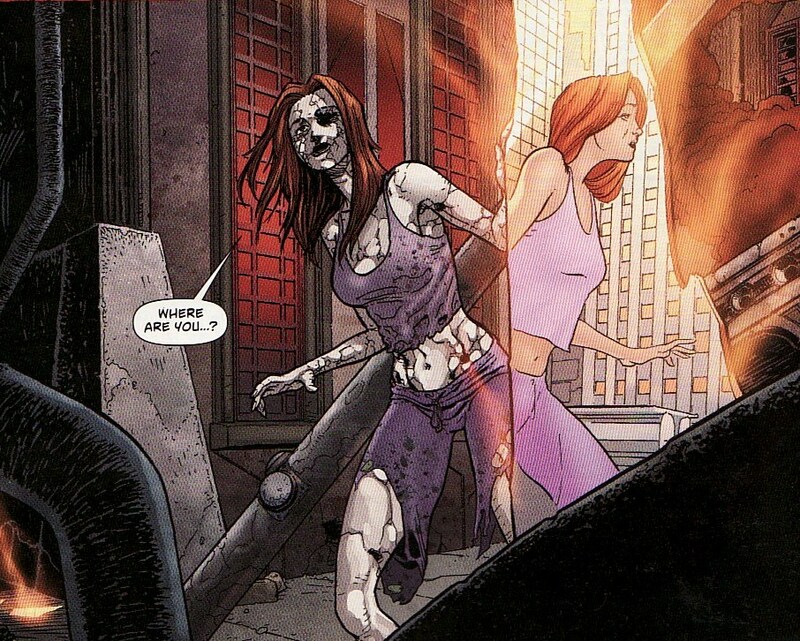 I think Mike Johnson set up Reign and Silver Banshee as specific Supergirl villains. I hope Nelson builds on that. And I hope he will think of using some more classic Supergirl villains to bring back. 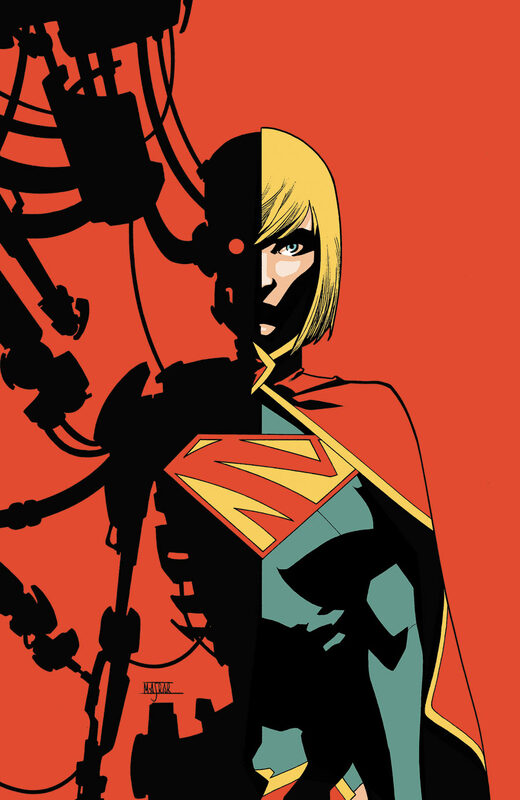 I like the idea of Cyborg Superman being a Kara rogue. CBN: Mike, you have been known for your writing of indie horror titles. Will any of that horror genre slip into the Girl of Steel's magazine? Michael Alan Nelson: Yes. Though I'm really focused on bringing a sense of fun and adventure to the title, there are some dark things coming up for Kara. Those who are familiar with my work know that I am always particularly cruel to my protagonists. But the reason I do that is because I believe that when a character is plunged into darkness, it makes their rise into the light that much sweeter. The trick is finding the right balance between fun, humor, and just enough darkness to keep the reader on her toes. I admit that I sometimes lean a little too much one way or the other, but if I do my job well, it will all even out in a way that makes the stories compelling. This answer reminded me of Peter David's run on his Supergirl title - never a bad thing. This wasn't Kara Zor-El. This was an Earth Angel, a merging of human and Matrix. And yet, that run, and in particular the first 50 issues, show a near-perfect understanding of who Supergirl is, her desire to do what's right, to be a hero. Her need to overcome tragedy and personal mistakes. And there was a fair amount of horror in that book. The main villain was the firstborn vampire who brought Hell to Earth. And yet, part of what David wanted to do was bring Supergirl as close to a breaking point as possible. The culmination of that first mega-arc has Supergirl sink low but then redeem herself. The bigger the sin, the bigger the redemption. But always in that deeper darker story was the typical PAD wit and adventure. And he also did a great job of acknowledging prior Supergirls without copying. 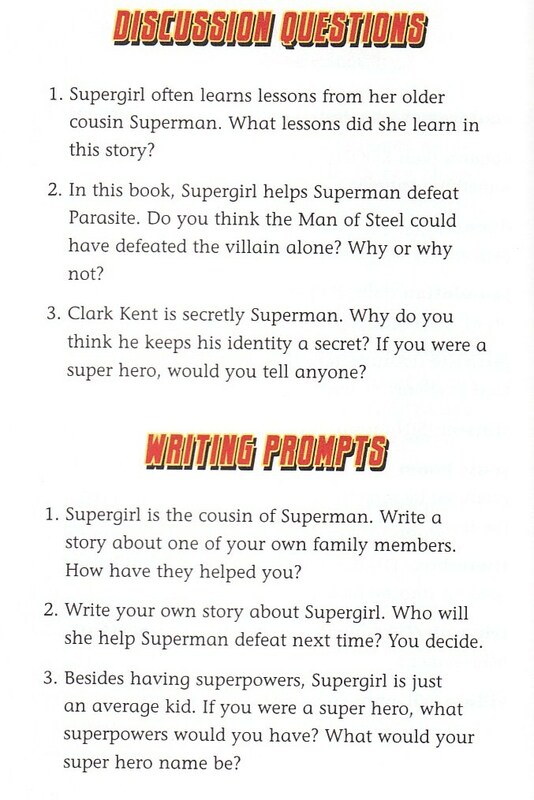 Now certainly this answer is skewed because I have read Nelson's Supergirl #20 which was wonderful. The fact that Nelson keeps saying he wants Supergirl to be happy, that he wants her to battle through the problems life brings to her makes sense to me. I suppose we will need to see just how he balances horror and fun. But I am willing to give him some leeway. 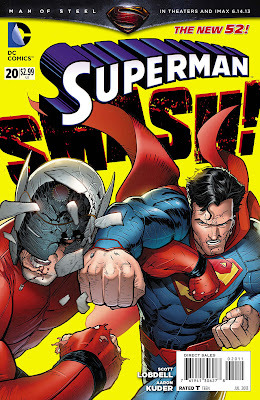 Superman #20 came out last week and I thought it was a pretty fun read with some very interesting moments. I certainly have had my complaints about Scott Lobdell and his treatment of Superman but one thing he shows here is just how vulnerable Superman would be to telepathic attacks. With the upcoming Psi-War storyline, I think this is just a sort of hors d'oeuvre to that larger arc. Now as usual, I have some small problems with the characterization of Superman. But with the shroud of 'altered mental status' hanging over the Man of Steel, I am a bit more willing to roll with things here. Add to that the tried and true comic plot line of two heroes slugging it out, something I am willing to accept when done rarely, and the big action, I thought this fun in a Michael Bay movie sort of a way. There is one thing about the book that I am still on the fence about. I have never been a fan of the Superman/Wonder Woman romance but whether I like it or not, it is happening. One thing that has bothered me is that the characterization of Diana in mainstream books like Justice League and Superman is so different from her character in her own book. I had actually started to read Wonder Woman as though it were an Elseworlds title. Lobdell brings her book and plot into this book. On the one hand, as someone who doesn't mind continuity, it made me glad to see this. On the other hand, it doesn't explain the difference of her character in the different books. 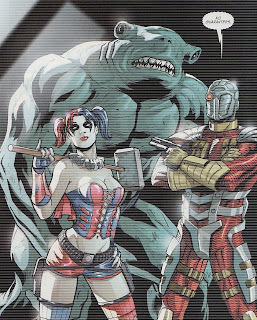 Aaron Kuder is on art here and I like his style. 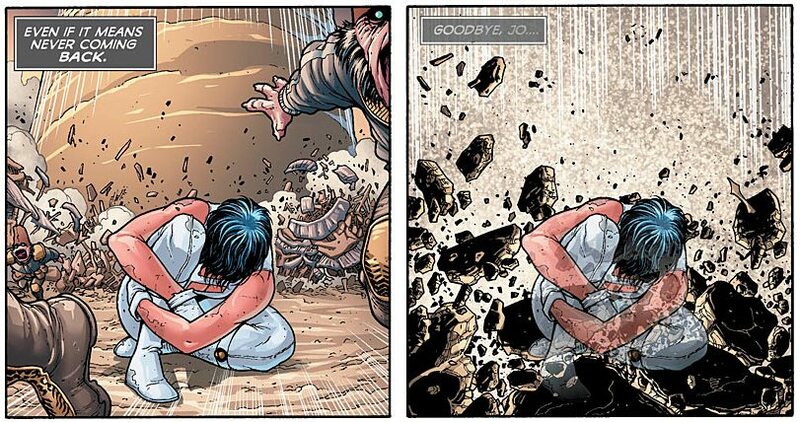 He isn't quite Frank Quitely but he quietly brought a Quitely sort of feeling to the issue. And that cover, with the bright yellow background certainly leapt off the racks. Now the book opens on a very intriguing scene. Ma and Pa Kent are alive. Clark is married to Lana Lang. And they have a 'little girl', a cute little puppy. It seems like the perfect life ... loving parents who understand you and a loving wife who accepts everything about you. There are some nice lines here like Lana saying she knew how crazy her life would when she agreed to be married to Clark as well as Pa talking about Clark's stubborn streak, like not giving up against Doomsday. But we know this is fantasy or telepathic-induced dream state because the Kents are long dead and we haven't seen much of Lana outside of a few scenes in Morrison and Fisch's Action Comics. What is interesting to me is that it is Lana that is the 'dream wife'. I might be overthinking this. But I find that Lobdell chose Lana for this scene extremely interesting. As I said, the art here works for me. I love this title page with Orion's fist shattering this fantasy world and smashing Superman. 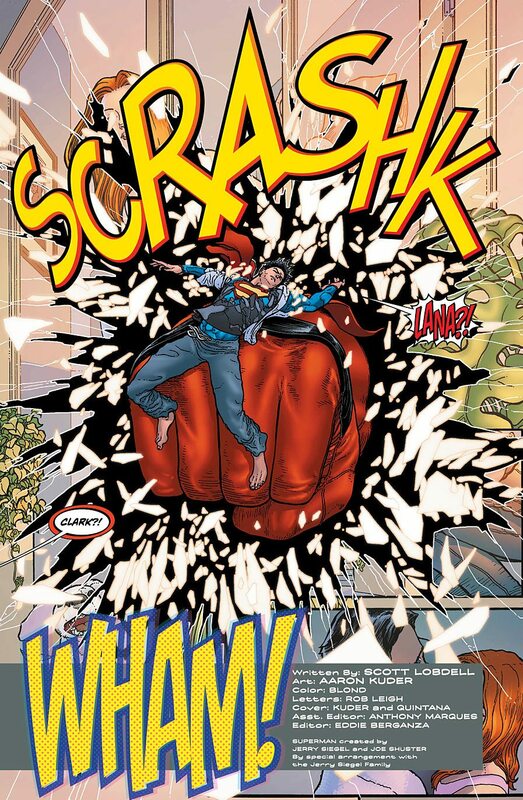 The huge fist destroying that world completely works as it jars Superman and brings him back to reality. I also like that the title is simply 'WHAM! ', keying me in that this is going to be a knockdown drag-out brawl. Orion and Superman certainly throw down pretty fast. I suppose I can understand why. Superman has been dealing with people acting crazily, his mind tampered with, and then out of nowhere someone he doesn't know attacks him. And the action is beautifully rendered in wide screen panels and splash pages. Orion punched through an empty building and skipping across the bay. Orion hoisting an aircraft carrier as a club. Big art for big action. Now I don't mind Superman using his fists against a presumed bad guy. But he should be above pettiness and this sort of chest thumping. If there was one thing that stuck out as feeling wrong in this issue it is this line from Superman talking about pounding Orion until he'll be in an ICU drinking from a straw. 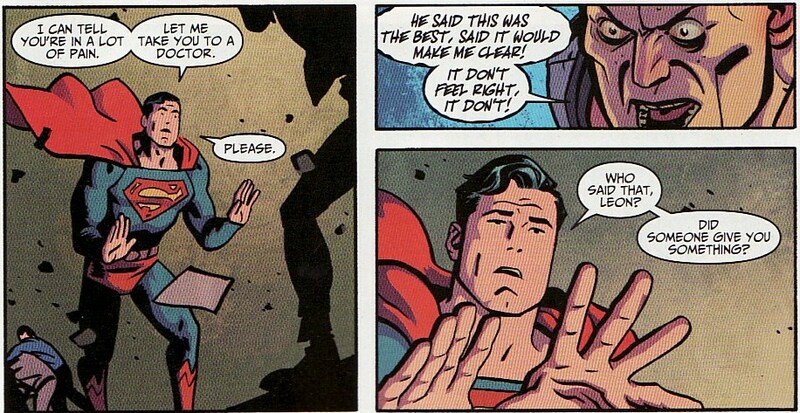 Superman shouldn't say things like that no matter how ticked off he is. This bothered me. Superman should inspire and no one would say this sort of thug-talk is inspirational. I do love how Kuder draws a huge S-shield. That is how it should be. During a pause in the brawl, Diana shows up. When she realizes that Orion is the 'villain', it leads to an awkward interaction. More than anything, this shows just how separate Wonder Woman's title has been. You would think that if she was in a close relationship with Clark that she would talk about Zola, the war of the gods, and Orion. But it is clear from her dialogue that Clark knows nothing about it. She says Orion is helping her with a 'project' ... not 'protecting Zola' ... not 'helping figure out Olympus' ... 'a project'. It basically means Clark knows nothing about her life. It really makes the relationship that much weaker in my mind. That said, I understand Superman's response to Orion. A beefy guy shows up who clearly has a history with your girlfriend, a history you know nothing about. I know I would feel awkward and respond icily. I think it humanizes Superman a bit. It turns out that the prophecy Orion heard about, the one where Superman destroys the Earth, was based on Hector Hammond possessing Superman. Orion actually apologizes for hitting first without talking. I absolutely loved this panel where Wonder Woman uses her lasso to coax Hammond to reveal himself. You can feel the surprise on Diana and Orion, both flinching away. And Hammond's head on Superman's body is just horrific. Funny how Hammond says he made a 'world of peace' for Superman and that was the Lana world. I don't know if I will ever understand the powers of Diana's lasso but this seemed an okay application. What I didn't necessarily like was how Orion is able to use his Mother Box to force Hammond out as well as build up psychic walls so Superman can't be possessed again. That all seemed deus ex machina to me. I suppose that I should say novus deus ex machina as this is a new god in a machine. It seemed a bit too easy. Okay. So while Orion continues to feel out if Diana has feelings for him and Diana keeps him at a distance, Superman sulks. 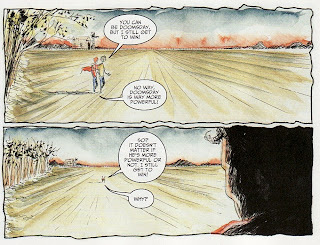 Artistically, this panel works sublimely with Superman tiny in the distance. As a guy who once felt like he was miles away while bruisers wooed wonderful women, I actually empathized here. For me, Superman is Clark, the shy nice farm boy. I could understand how he might be intimidated or feel hurt from this. She is a princess. Orion is a god. Clark is a farmer's son. It's why he didn't think he should date her in the Byrne era. I said it before, it sort of humanized Clark a bit. And, I suppose it shows just how awkward I must have felt in my adolescence if it still surges to the surface now and then. I do wonder if I am in the minority here. I wonder if this whole interaction seems off for other people. I especially wonder what Diana fans think. Orion leaves and Clark and Diana promise each other a quiet night together. Hopefully she will tell him something about her life! And I would have been okay if the issue ended there. But instead we get this weird image of a decaying Lana from the dream world apparently still somewhere in the deep recesses of Superman's mind. Pretty scary image, especially given the more pristine Lana seen in the reflection. Will this seed left by Hammond be utilized by someone in the upcoming Psi-War? I hope so. I would hate for this page to never be referenced again. So where do I land with this issue. Certainly there were parts that I enjoyed - the big action, Superman feeling spurned a bit, the intriguing Lana world, and Aaron Kuder's art. But Superman saying he was going to smash Orion felt off. And this issue weakened the Clark/Diana relationship more since it is clear she doesn't talk to him at all about anything happening in her life. I suppose I was in the mood for loud action. 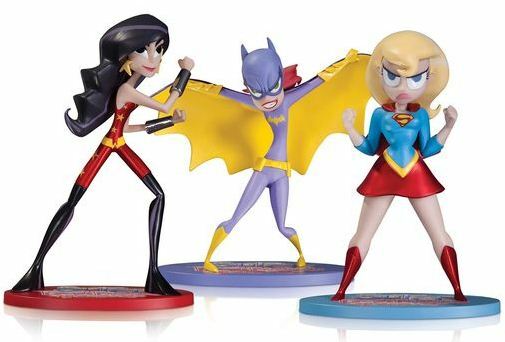 San Diego Comic-Con Exclusives Include SBFFs! Heading to the San Diego Comic-Con is sort of a bucket list event for me. I just can't imagine ever having the free time or liquid cash to be able to do such a thing. It is hard to get any sense of the size of these things. I can't tell if they are plastic or more like statues. What we do know is the three-pack costs $49.99. So I would hope they aren't 2 inch plastic things. Regardless, I want these badly but will have to wait for someone to put them on an internet auction site. Let's face it, Super Best Friends Forever was a great series of shorts in the DC Nation block and I can only hope that at some point Warner Brother and DC Entertainment will do the right thing and let Lauren Faust make more of these cartoons. I know I am a bit late but here is a bullet review of Vibe #4. One of the things that stands out for me with this book is the sensibilities of Paco as a new young hero. I am a sucker for the 'hero's journey' and no one seems to capture that as well as writer Sterling Gates. Here is Vibe, a good person, trying to figure out his powers, trying to figure out his place in the world, and trying to figure out the intentions of A.R.G.U.S. Does he want to work for this group? Is he a good person working for a bad group? I know that sales haven't been phenomenal for this book but I hope we have time to explore all the pressures on Vibe. He clearly has a sense of right and wrong. But he needs to worry about his family. The government is providing some stuff for him. Will he sacrifice who he is to protect his family? 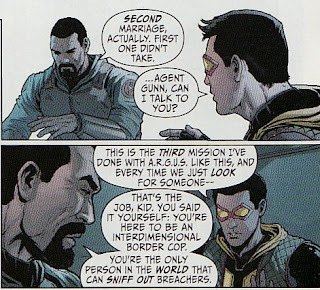 On top of that, I am intrigued about the breachers into the DCnU, those other-dimensional beings who cross over. I keep hoping we are going to see a veritable Who's Who of breachers from the old DCU in these issues. Pete Woods is off this issue so art is done by Manual Garcia and Fabiano Neves. I like the soft tones on the later pages involving Gypsy. Last issue ended with a super-powered invader teleporting into Paco's house. We learn that he had been captured by ARGUS and was called The Breacher, or Subject Zero. It is a brief encounter as he is 'pulled back' by someone or someones before he can talk to Vibe for any length of time. As always, I am intrigued by Breacher, wondering if anyone we know is under that mask. The costume has a bit of an OMAC feel to it. But could it be Breach, the Captain Atom variant from a few years ago? And who is calling him back? He doesn't seem happy about it. And the purple energy sort of struck me as Pariah-like. Meanwhile, Gypsy had also escaped last issue. 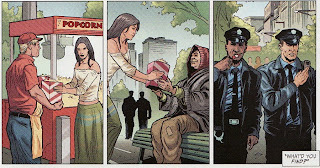 On the run from both ARGUS and the plain old police, she uses her powers to great effect at a street bazaar. I like how she adopts a sort of variation of her more classic DCU 'costume' just by buying clothes at this fair. Very nice nod to history there. It is clear that Gypsy is a nice person, buying popcorn for a homeless person and generally hiding out. But she also has some fierce skills. She is able to 'bend light' to create sort of illusions around herself to look like anyone else. And she has martial arts skills as we see her thrashing people with flurries of kicks and punches. Gypsy is considered a major threat to our Earth by A.R.G.U.S. Vibe is called in to locate and detain her. Between last issue's run in with Kid Flash and the early encounter with Breacher, Vibe is starting to question his mission. He isn't exactly ready to completely rebel. But he wants more information about these people he is hunting down. It makes sense that he would be torn. He is a kid who has been inducted into the Justice League so that is a good deal. But he doesn't want to imprison people wrongly. And I like how Dale Gunn is sort of a sounding board. 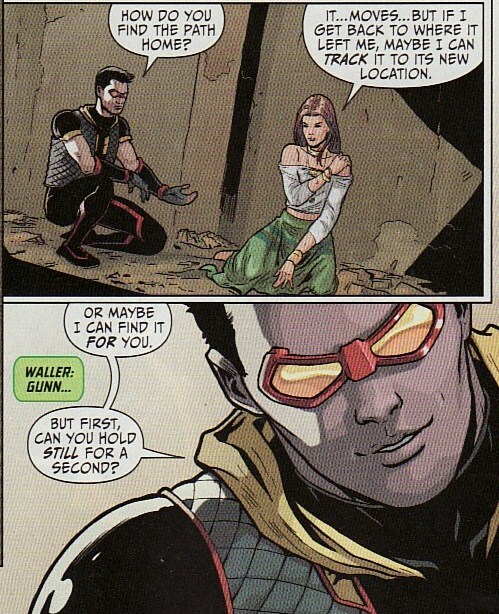 Gunn isn't as much of a lunatic as Amanda Waller. But he seems to fall in line with orders pretty quickly. In a scene which mirrors (maybe a bit too closely) last issue's scene with Kid Flash, Vibe is able to befriend Gypsy and tries to figure out is she really some sort of threat to Earth. Vibe has been told Gypsy is a vanguard for an invasion. She tells him she is lost, sucked through a portal she is trying to find to return home. This is two issues in a row where Vibe has disobeyed orders and ARGUS isn't going to be happy about that. Maybe that conflict between Vibe and his bosses is going to happen sooner rather than later. One thing I did like about the issue is how Gates is able to show how big a threat Gypsy would be. While Vibe is able to single her out, throughout the issue we see her as Batman, as Vibe, as a homeless person. She would be able to hide in plain sight incredibly well. And best of all, sometimes as readers we aren't let in on the feint at first. When she looks like Vibe, I assumed it was Vibe until she dropped her glamour. Nice. I like being surprised when I read comics. Well, if Vibe isn't going to bring in Gypsy, Amanda Waller decides she'll have someone bring in Gypsy and Vibe. Here comes the Suicide Squad! Okay, as a comic reader who cut my teeth on Legion, Teen Titans, Firestorm, and (of course) Supergirl, I have a soft spot for a title based on a young hero learning the ropes. Vibe settles nicely into that genre of comics and I have to say, I am enjoying it. Considering the fact that I have thought Vibe was a complete joke for 3 decades, I think kudos are in order for DC, Geoff Johns, and Sterling Gates. I suppose I will have to wait a bit to see a jail break from the Circus of captured interdimensional characters. But I better see one! 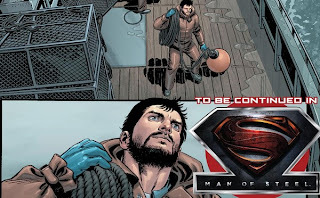 I know that I just covered the Man of Steel prequel comic just a couple of days ago here but after reading it in its entirety I just had to cover a couple of things I didn't get to show closely the first time. But before I get there, I had to thank everyone here who helped me actually get to see this thing from sending me unused codes from the early admission tickets (thanks Kent!) to sending me to websites where the book was already pulled down to finally getting me to see it all. I love the Supergirl community here and just want to thank everyone for helping me out! Now I fervently hope that this ends up being in print and more widely distributed than just to those WalMart ticket buyers because this is truly an excellent Supergirl story. If this is the first exposure that someone has to Kara Zor-El, they are going to come away impressed because she is smart, strong, and determined throughout this story. It also has some hopeful moments ... things that make me think that maybe, if the stars align, we will again see Supergirl on the big screen. I shouldn't be surprised when I see that the script was done by Sterling Gates. He always showed those traits in Supergirl during his run. Writing her again must have been a treat. But look at the other credits! This story of Kara is by David Goyer, Geoff Johns, and Zack Snyder. They also must have that understanding of who Supergirl is. Just fantastic. I know I shared some pages last time but here a few more panels that Supergirl fans need to see. The story starts with some sort of military expedition in the wilderness, some sort of survival training to see who will pass and become a Kryptonian space pioneer. I guess it makes sense to make sure there is a sort of Bear Grylls 'Man versus Wild' ingenuity of these candidates if they are heading to a alien world. And Gates sprinkles lots of Easter Eggs in the story including a shot of the Fire Falls. Since only four of these candidates will get picked, Dev-Em decides to move the odds in his favor by killing the other troops. That includes Kell-Ur, Kara's significant other. She watches him die while remembering how they talked of traveling the starways together. Not only is Kara one of these trainees, she assumes to role of leader. And when she learns of Dev-Em's treachery, she takes matters into her own hands, beating him up and capturing him. While Dev-Em gets sentenced to life imprisonment, Kara ends up graduating and being picked for space exploration. On top of that she gets 'The Star of Rao', the highest distinction on Krypton for her impeccable scholastics and capturing Dev-Em. So Supergirl is a smart and strong hero on her own world. Well, as we know, Dev-Em escapes somehow, gets on Kara's ship, and kills her crew while she remains in suspended animation. While in suspended animation, Kara has a dream sequence where she is able to save Kell-Ur from falling to his death. I find it absolutely fascinating that the script calls for her to dream of flying and saving him, under a yellow sun no less. This had the feeling of foreshadowing to me, as if this is to set up her heroics in the future. There is really no other reason for this to be there ... right? She awakens from sleep to find that Dev-Em has killed the crew and taken to the ship to the Sol system. The two fight and it becomes apparent they have super powers in our galaxy. Punches dent walls. And the only thing that Kara can use to hurt Dev-Em is the sunstone her parents gave her. The super-powered brawl destabilizes the ship such that it is forced to crash on Earth. Amazingly, Kara jumps into the pilot's seat and flies the thing to the northern area of Canada. Again, another nice moment of bravery and intestinal fortitude on her part. But, she crashes in what seems to be prehistoric time, cave dwellers painting the S-shield on their walls. It is an ambiguous ending in terms of Dev-Em and Kara's fate. If they have powers, should they survive the crash? The ship says it is attempting self-repairs. Could Kara re-freeze herself? Or do we assume they die in the crash? Regardless, the ship starts calling out to Clark. What a fabulous Supergirl story! Kara is smart, strong, resourceful, and gutsy. She is a leader and a hero. I loved this! 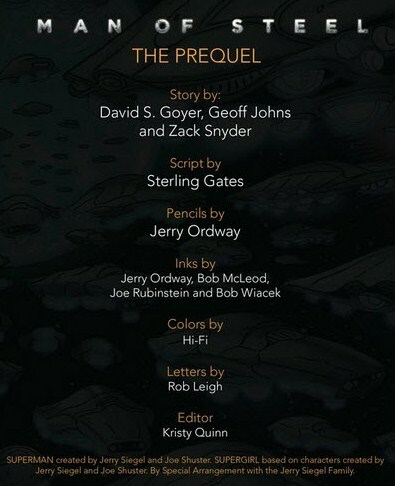 Kudos to Goyer, Johns, Snyder, and Sterling Gates. Jerry Ordway does an excellent job on art here, no big surprise, handling the alien areas of Krypton and the interior of the ship perfectly. I am not expecting much in the actual Man of Steel movie in terms of Supergirl. But if this is percolating in the back of the film creators' minds, we might have a nice surprise at some point! Legion of Super-Heroes #20 came out last week, on the heels of the announcement that Legion would be cancelled in August. 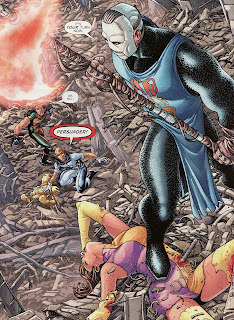 It brings another layer of commentary to this current Fatal Five story. Let's face it, this is the end of this title and this Legion. What will come out of this story? 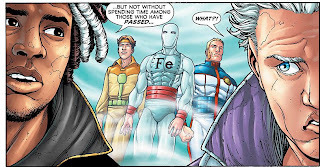 Is it going to be a reboot meaning we won't see these particular Legionnaires again? Will it be a sort of house-cleaning by DC, trimming the 'fat' of the team, culling it down to only seven members as rumors state? Of course, this story can be both a house-cleaning and a pre-reboot arc at the same time. 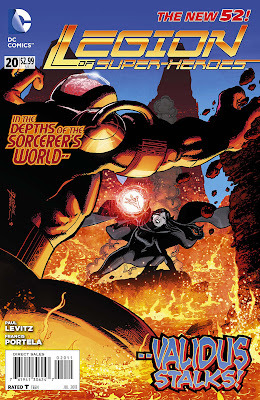 Maybe this is the last chance writer Paul Levitz has with these characters and he wants to write their ultimate fate. We have seen death and disappearance here. It all is leading up to the cancellation. And this issue continues to breakneck pace of the prior issues as we reel from one catastrophe to the next. Let's face it, this title has been treading water for some time now. This arc has ratcheted up the action quite a bit. And yes, it has included the deaths of a number of Legionnaires, making it seem 'relevant'. But maybe an injection of new creative juices will help. One thing to cheer about with this issue is the return of Francis Portela on artwork. His style is so slick and polished, it just works perfectly on a Legion book. In particular, I loved his Validus in this book as he looked gargantuan and monstrous. We saw last issue that Glorith was able to take Ultra Boy and Chameleon Boy off of Rimbor and back to the Sorceror's World. 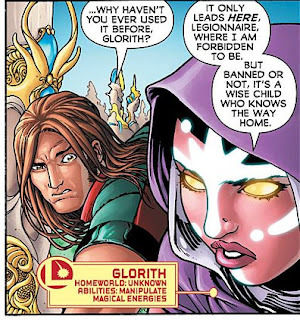 I had completely forgotten that Glorith was basically banished off of the Sorceror's World by the Black Witch. I have said from the beginning that Glorith is a super-villain in waiting. This banishment certainly does add something to that. 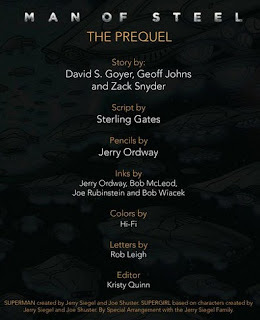 As I said above, Levitz certainly seems to be clearing the deck for the next version of the Legion. Sun Boy is dead. Star Boy is presumed dead. Here, in a last ditch effort to get away from the Promethean Giant, Phantom Girl escapes in a way that means she is 'never coming back'. I suppose the implication here is that she has irrevocably returned to Bgztl's home dimension. But why? Why not just go phantom here and let the Giant's fingers run through you? If this is true and she is really gone, this is a pretty lousy way for Tinya to end her Legion career. It is especially distasteful given that she never even got a chance to act as a true leader. If dead, it really seemed like a forced way to trim the roster. But maybe she isn't really dead. Polar Boy and Invisible Kid seemed pretty dead last month, crushed by the Promethean Giant. Instead, we see that Invisible Kid has shunted them to a sort of dimension of the near dead/limbo. We see the two Legionnaires near the ghosts(?) of the original Invisible Kid, Ferro Lad, and Earth Man. In a nutshell, this is something of the problem with the Legion. 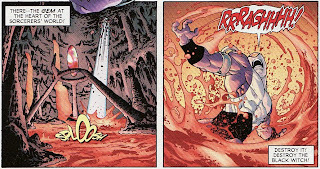 This scene is riffing on a little known power that Jacques manifested way back in the early 80s Legion, perhaps best seen in Legion of Super-Heroes #299 when he needed to fetch Wildfire's spirit. So I know that, as a guy steeped in Legion lore for decades. But would new readers know it? Or would it drive new readers away? 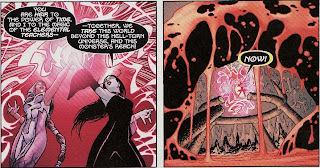 Meanwhile, on Sorceror's World, the Legionnaires link up with the Black Witch and Blok. 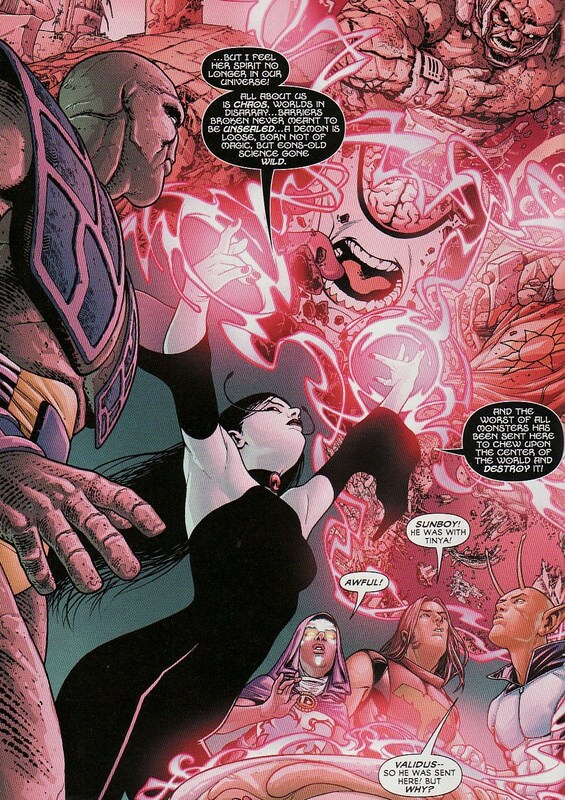 The Black Witch, you might recall, is housing Mordru's spirit inside herself, acting as a living prison. The devastation by Validus on the planet has shaken the planet but not Mysa's resolve. She is, at least for now, able to hold Mordru inside her. With technology down around the universe, Mysa is able to fill in Cham, Jo, and Glorith about all that has happened. She shows them the Promethean Giant, Validus, and the death of Sun Boy. Yes, it is a bit of exposition. But what a lovely page by Portela. I love this sort of up-shot with Mysa's arms outstretched. Lovely colors here as well. It is hard to know if the next Legion will be brand new or picking up the pieces here. But if we are carrying on from here, I think it is clear that Cham and Ultra Boy will survive this mess and move on. 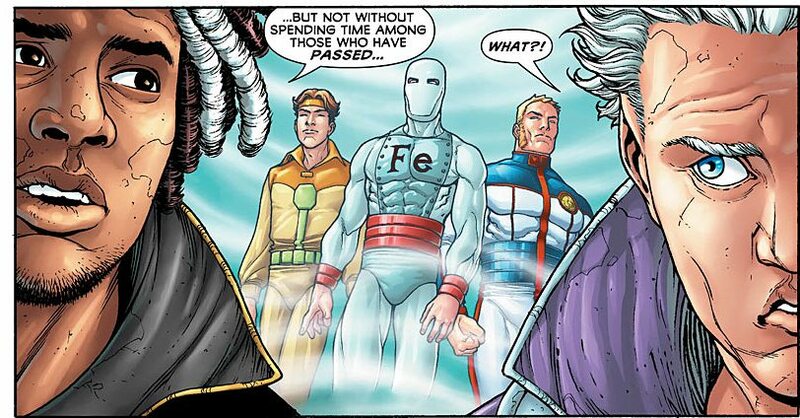 As I said, it is hard to know how many of the Legionnaires (outside Sun Boy) who appear dead or gone are actually dead or gone. Here, I found it very interesting that he states that Phantom Girl was the one Legionnaire he feared. So maybe Tinya isn't really gone. 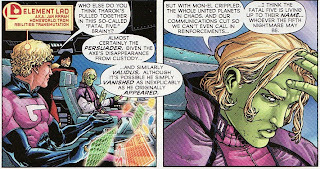 Maybe she will come back to save the day and sort of salvage her term as Legion Leader. What I don't know is just why Tharok fears her the most. 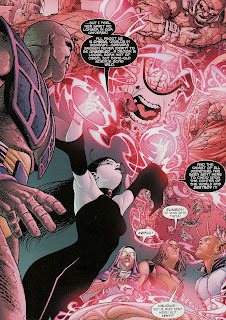 Could it be that in phantom mode she can somehow disrupt Tharok in his own tech-ghost form. 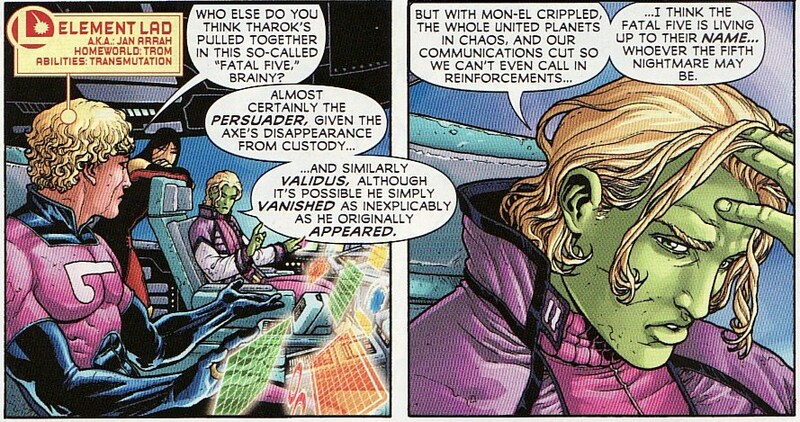 It turns out that Tharok is in control of Validus (a nice flashback to their very first appearance way back in Adventure Comics #352. Validus' mission is to head to the center of Sorceror's World to destroy the gem at the heart of planet. It reminds me that I need to review just how closely linked Amethyst's Gem World with the Sorceror's World. But somehow destroying the gem will destroy the world. As I said earlier, Portela's art is incredibly slick here and his Validus is unbelievably wild. Look at that second panel. 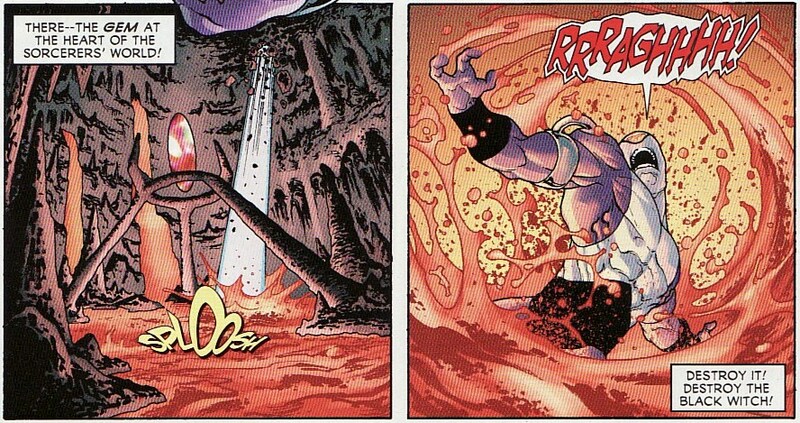 You just sense the power and rage here as he splashes in the lava. Now we have only seen four of the Fatal Five. And Mano hasn't been seen or heard from in this arc. So who is the fifth member? I am calling it now. It's Glorith. And if it isn't here, it is someone within the Legion. 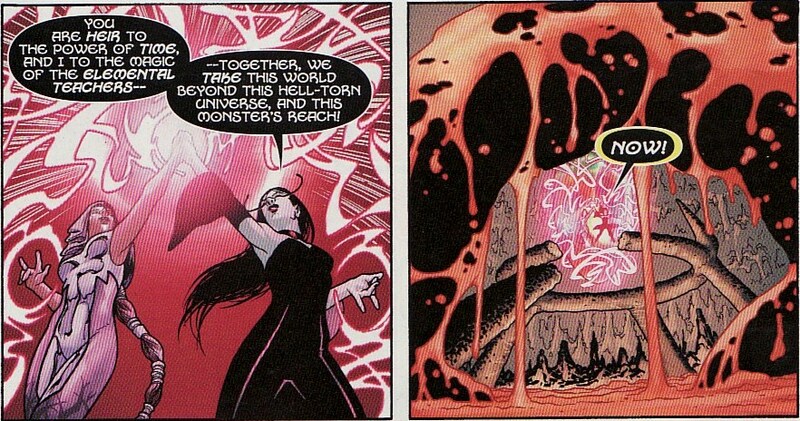 It turns out that the only way to defend the gem at the core of Sorceror's World is for Black Witch and Glorith to unite their powers and basically teleport everyone ... Validus and the Legion ... away. I thought it was great to see Blok actually try to hold off Validus here, allowing Mysa the time to get the spell together. I thought for sure he was going to die in this arc and maybe he will. But there would have been no better time for him to get killed than here. So maybe he survives. The one thing I didn't like here was that Validus appears about 15 feet tall here, as opposed to the more gargantuan size I have become used to seeing. So Validus is suddenly in deep space. And Cham and Ultra Boy are teleported back to Earth, to the Legion Headquarters. No surprise, the headquarters is in ruins. Everything seems to be falling apart in the universe right now. Unfortunately, there is more here than just decay. The Persuader is there. And it looks like he has killed (or nearly killed) Luornu. I mean it would be hard to easily survive a chunk of rebar through the abdomen as well as other debris embedded in you. That is some cliffhanger! Who else is dying in the debris? Again, I love Portela's look here in his chain-mail, tunic, and skull mask. Fantastic. So the action and death and craziness certainly continued in this issue. But it has a different feeling now that I know that the title is ending in a couple of issues. Is this the end of this continuity? Are we simply erasing the blackboard to write a new history? Is this some editorial mandate to reduce the roster and make the universe darker? All that said, I have to say this wild ride is probably the most memorable Legion story that has come out in the last 3 years or so. 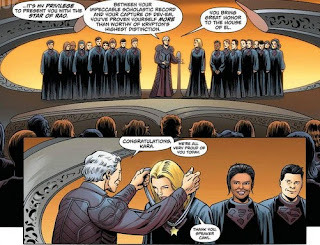 In what should be great news, Kara Zor-El is prominently featured in a prequel comic of the Man of Steel movie. In what should be even more phenomenal news, the story is written by Supergirl wunderkind Sterling Gates and drawn by legend Jerry Ordway. The idea of Supergirl being around in the 'movie universe' is incredible and it makes me thrilled as a Kara fan. This prequel is only available as a download and only if you purchase the advance movie tickets from Walmart. So no Walmart tickets, no prequel comic. I guess I can understand the idea of giving perks to folks who are dedicated enough to buy the advance tickets. But it seems cruel to deny me (yes I am being selfish) this story. And from what I gather from perusing all the websites which have covered this story, this story probably has a big impact on the movie story. Here are the pages which have been released to the public. My understanding here is that Kara has just passed some sort of endurance test/course and is declared eligible to be a sort of Kryptonian space explorer/pioneer. Here Zor-El and Lara give her a gift of a sunstone complete with a picture of Kara hugging someone in a 'happy moment'! So a strong Kara gearing up to explore space and colonize a new world. It is interesting that such a space fleet of ships is part of this world's history. I suppose it explains how Zod and his troops can be around in the movie. But it makes that 'last son of Krypton' tagline much less applicable. 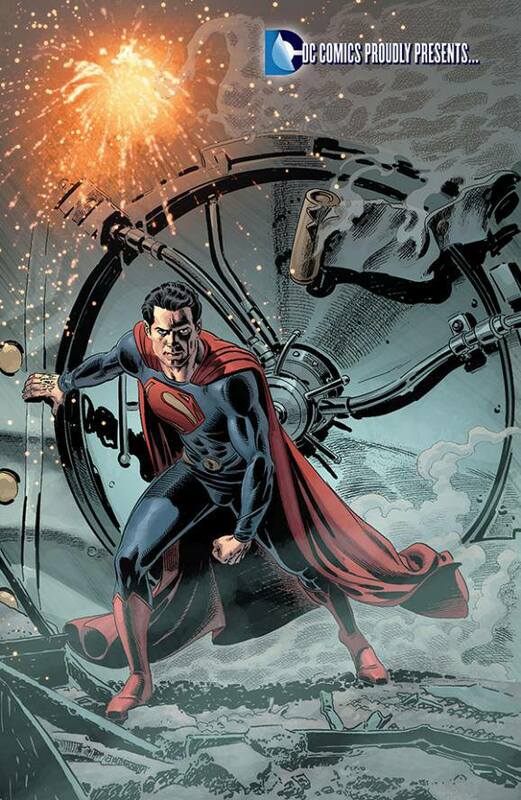 Are there all sorts of Kryptonian worlds out there? One of the applicants for this service is Dev-Em. Dev-Em murders someone in that trial and is sentenced to life in prison. Here Dev-Em escapes. Dev-Em in the Silver Age was a Kryptonian juvenile delinquent who survived the planet's explosion. Initially a villain, he reforms and becomes a hero in the 30th century Legion books. 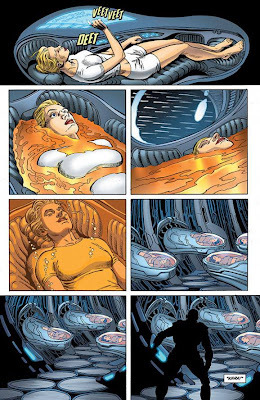 Kara places herself in suspended animation for this space trip. Unfortunately, Dev-Em is on the ship and kills everyone of the crew except Kara. Eventually Kara awakens, discovers her crew dead, and battle Dev-Em on the ship. The battle damages the ship such that it has to crash on the 'nearest' safe planet which turns out to be .... Earth! Incredibly, the ship crashes in prehistoric times. Apparently we see neanderthals outside the ship as it crashes into northern Canada. Does Kara survive? Is she able to place herself into suspended animation again? Will she be part of any sequels that happen? Who knows. But my guess is her ship and the sunstone somehow tie into the Fortress of Solitude. The book ends with Clark in his 'fisherman' guise, presumably nearing the crash site. How I wish I could read this book in its entirety! Hopefully it will make some trade at some point. But let's not miss the big picture. Supergirl is prominently mentioned and is a plot point in an upcoming mega-movie. No complaints here ... unless Clark discovers her skeleton in the Fortress/ship. If anyone has read this thing fully please comment and let me know if I missed anything!